From as early as 1398 the surname Tozer was associated with Bow, and this association continued until the 1890s. Throughout that time there was a blacksmith of that name in the village. Latterly at least, the Blacksmith’s shop was on a site opposite the schoolmaster’s house at the bottom of School Hill, called "Crispins" now the site of houses appropriately named “Tozers”. Charles Tozer (alias Dart), born in Bow in 1793, was a blacksmith. His parents were Mark Tozer (alias Dart) and Mary Middleweek. In 1822 in Bow he married Fanny Tryphena Cockram (who already had an illegitimate son); they went on to have six more sons. Most of them had careers as smiths or farriers. In the census of 1851 the three youngest sons William (22), Richard (19) and Henry (17) were shown residing at their father’s blacksmith’s shop in Bow, but within a few years they were all in the USA. They were following the gold rush, but using the metalworking skills they had learnt at home. In 1864 two letters from Henry and Richard to their parents in Bow were published in a Westcountry newspaper which allow an insight into life in the USA towards the end of the Civil War. After ten years in the States, Henry returned to England, married Susan Rowden from Bow in 1869, and later moved to Middlesex. William, who probably had married in USA, also settled in London, where the brothers both were farriers. But Richard remained in America. Their parents continued to live in Bow until they both died in 1871. Baptised in Bow on Christmas Day 1832, Richard settled in Columbia in South Carolina in about 1852. In 1859 he married Mary Ann Dial, the daughter of a German immigrant baker. 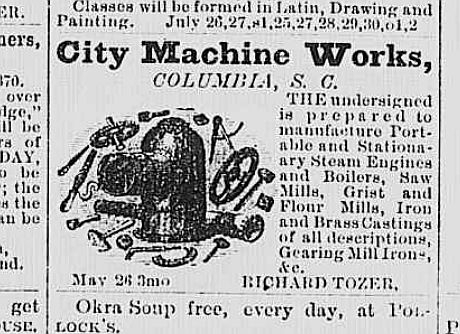 He was elected Superintendent of Water Works of Columbia before setting up in business on his own. He became famed for the manufacture of portable steam engines. His engines used in plantations and farms regulary won gold medals at the South Carolina State Fairs. "As an inventor and perfecter of the great principles of steam engineering Richard Tozer deserves a high place in American industry. 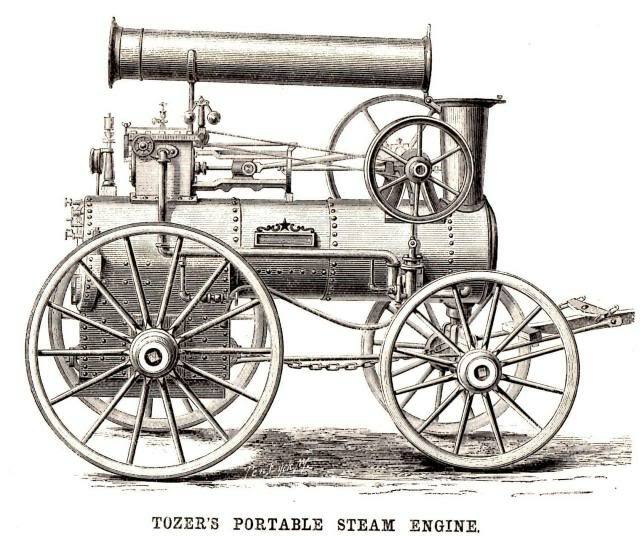 He developed and perfected the famous Tozer engine, which brought into use a new principle in generating steam, practically revolutionizing the steam engine." 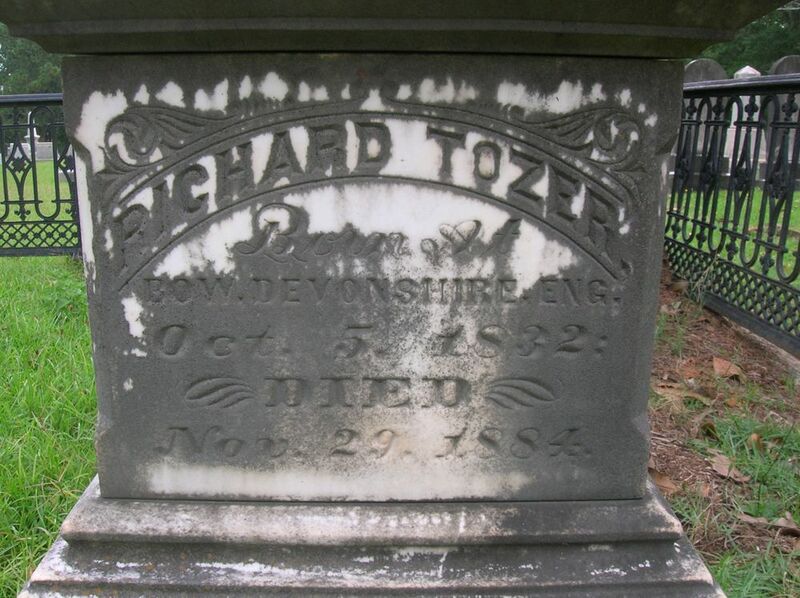 His business initially prospered but ran into difficulties before being taken over by his brother in law, George L Dial, and the firm became "Tozer and Dial"
He had no children and died in November 1884, aged 52. "Some five to six weeks previously, Mr Tozer met with a very serious accident in being thrown in a wagon by a runaway horse and he never entirely recovered from his injuries though the immediate cause of death was pneumonia"